These dental treatments are used both to combat decay that has already begun, and to prevent future decay from degrading a tooth. A composite dental filling is a tooth-colored material used to fill in holes in teeth created by decay. Composite fillings are only used for small surface fillings where structural damage is insignificant. Dr. Sheridan prefers porcelain inlays and onlays for any cavity on the biting surface of a tooth. Inlays/onlays are restorations that are created in our lab and bonded to teeth. A dental crown is a restoration that is placed over the visible portion of a tooth, unlike fillings and inlays/onlays which only cover a portion of the visible enamel. Dr. Sheridan prefers to use all-porcelain crowns on most patients but occasionally may recommend PFM (porcelain-fused-to metal). Crowns are recommended when decay or injury has compromised the function and durability of a tooth, and are also placed as part of a dental bridge to fill in missing teeth. If there are neuromuscular issues that would prevent installation of an all-porcelain crown, Dr. Sheridan prefers to address them before placing the restoration. We choose to use high-quality dental porcelain in order to create beautiful, enduring restorations for every patient. We feel that porcelain is superior in color and texture compared to other dental materials. If we are going to place permanent additions to your smile, they should look very natural and be built to last. With metal, you are telling the world you have had dental work done. Also, we are not comfortable with the controversy surrounding the use of mercury in the mouth. With porcelain, no one has to know you were not born with your smile and you get the peace of mind that comes with a safe, biocompatible dental choice. Please contact Sheridan Dental today to talk to Dr. Sheridan about our restoration options and the benefits of porcelain dental crowns and fillings. 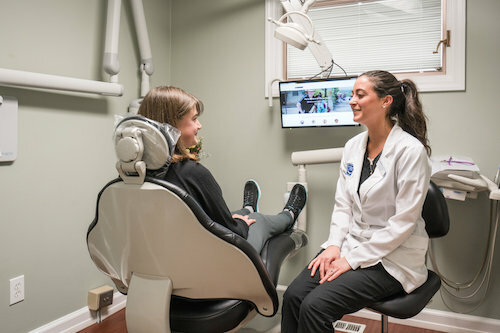 We offer our Grove City and Columbus patients free consultations and a comfortable dental experience centered around personal service.